A player lost most of his chips on the hand before hand-to-hand play begun. He was left with 1,000, and the ante is 500. Before the next hand was dealt, that player walked away, even though the floor staff and players told him he could still cash. Two hands later and he was all in for the ante and his hand was declared dead. 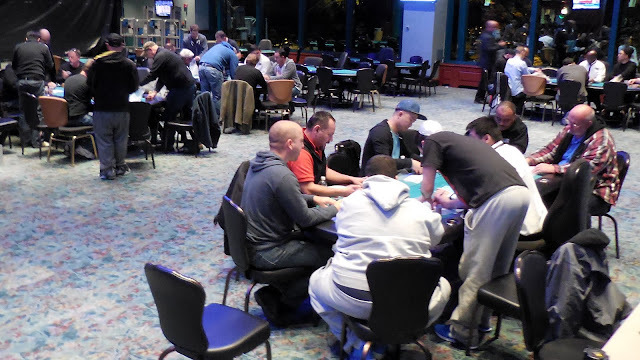 No other players busted, so the remaining 36 players are now in the money and are bagging up for the night. Names and chip counts from Day 1A & B combined will be posted in the next few hours. There was a double elimination on table 7 when a player's [Ad][Ac] trumped [Qh][Qd] and [Ad][Jc]. The board ran out [3s][2s][3h][Ks][Td] and those two eliminations bring us to 37 players remaining. Hand-for-hand play will begin shortly. Halfway through level 17 there are 42 players remaining, needing just 6 players left to bust to end Day 1B. Back on table 2, the players are discussing folding pocket aces preflop. Apparently one player had this scenario come up at a final table, and all the players are discussing whether they would fold or not. "Don't fold! That's my expert advice," quips Tim Reilly. With 4 minutes left in Level 14, a table was broken. That means we're down to 72 players as the 1,200/2,400 blind level approaches. Play will stop when the final 36 players are reached. 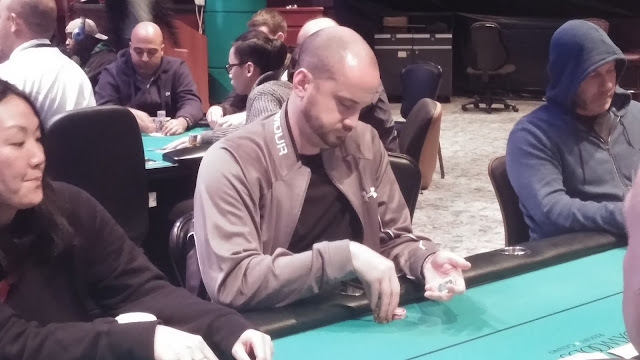 We missed Tim Reilly in the last chip counts update, so we thought we'd follow him for an orbit. Hand 1: Tim is under the gun and folds. The hijack limps and is against the small and big blind. All check the [6c][kd][4d] flop and the small blind bets 3,900 on the [3s] turn. The big blind and limped call. The river hits [as] and all three players check. The big blind takes down the pot with [6c][2s]. Hand 2: Tim is in the big blind and gets a walk. Hand 3: Chris Leong opens the pot in late position and Tim folds the small blind. Chris wins this pot. Hand 4: Tim is on the button and raises to 10,000 after three limpers. UTG thinks for awhile before folding, and the other two limped fold as well. Tim wins the pot. Hand 5: A player in middle position limps and Tim folds the cutoff. The button moves all in and wins the pot. Hand 6: Chris Leong opens from UTG and wins the blinds and antes. 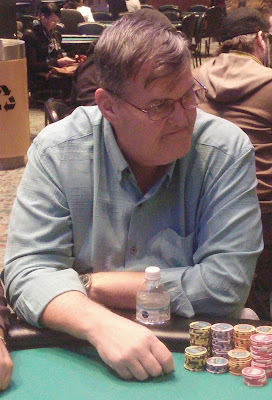 Hand 7: Tim folds from middle position. 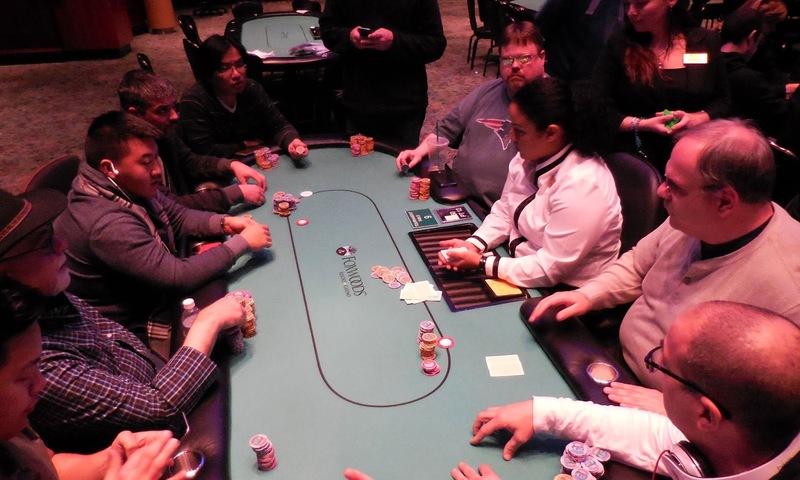 The small blind raises to 5,000 and Chris Leong moves all in from the big blind. The small blind thinks for awhile and folds the [ad] face up. Chris shows him [9d][9c]. Hand 8: Tim folds from early position. The button, small blind, and big blind see the [qc][2c][7c] flop for the minimum. They check the [3h] turn and [jd] river. The button wins the pot with [ah][ts]. Hand 9: Tim raises to 5,000 from UTG+1. One player calls and the flop falls [as][9d][ac]. Tim check-calls a 5,500 bet to see the [5h] turn. Again, Tim checks, and his opponent bets 11,300. After some time in the tank, Tim folds. Just 87 players remain from the 300 players that entered Flight B. Those players are now on their 1 hour dinner break. When play resumes at approximately 8:05pm, blinds will be 1,000/2,000 with a 300 ante. Hand 1: Kevin is on the button and folds to an early position player's all in. Another player calls and it's a race with KQ vs 55. A queen spikes on the turn and the player with KQ doubles up. 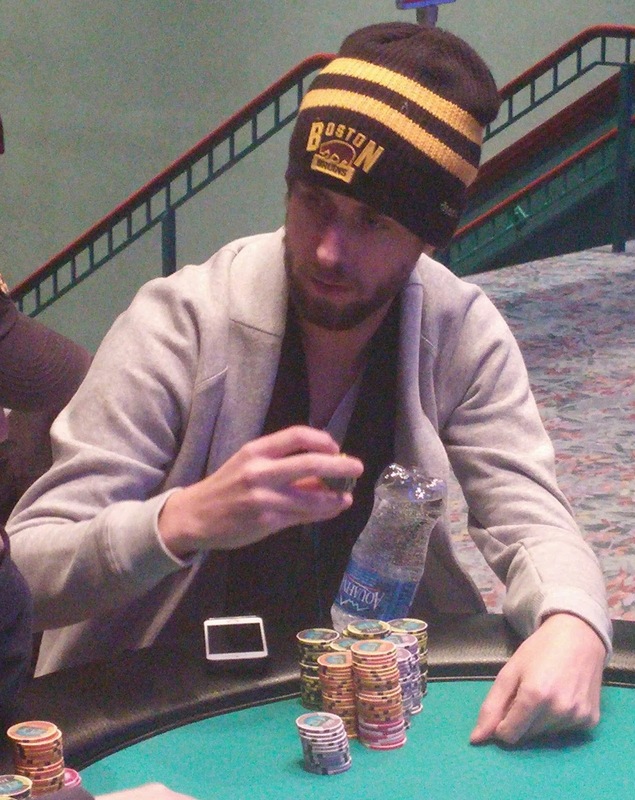 Hand 2: Kevin is in the cutoff and folds to an open from middle position. The button calls and the two see a [9s][jc][ks] flop. The middle position player puts his opponent all in and wins the pot. Hand 3: Kevin is in the hijack and raises to 3,500 after everyone else folds. The cutoff moves all in for 15,800 and the small blind makes the call. Kevin sighs and folds, being shown Q-4 and A-K, and the cutoff is eliminated. Hand 4: Everyone folds to the cutoff who opens the pot. The small blind defends, and then check-folds on the [3s][6s][2c] flop. Hand 5: An early position player limps and the next player raises. Kevin folds and see the cutoff and limper call. The flop falls [js][5s][tc] and the preflop raiser moves all in after being checked to. The limper calls with [qs][9s] only to see [as][ks]. The board runs out [2s][ah] and the ace high flush will win this pot. Hand 6: All players fold to the cutoff who moves all in for around 20,000. He gets no callers and increases his stack. Hand 7: Kevin raises to 3,500 from UTG+1 and the small blind calls. The two see a [3h][2c][ks] and Kevin gets check raised. Kevin folds and is shown the [kd]. Hand 8: Kevin is under the gun and folds, accidentally exposing the [4d]. A player in middle position raises to 4,500 and is called by the small blind. 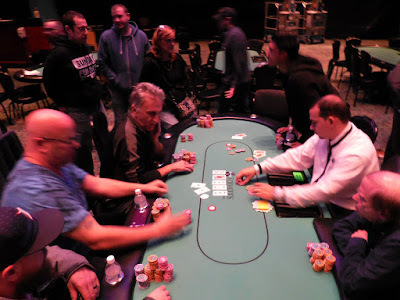 The flop Falla [qd][8s][7h] and a continuation bet takes it down. 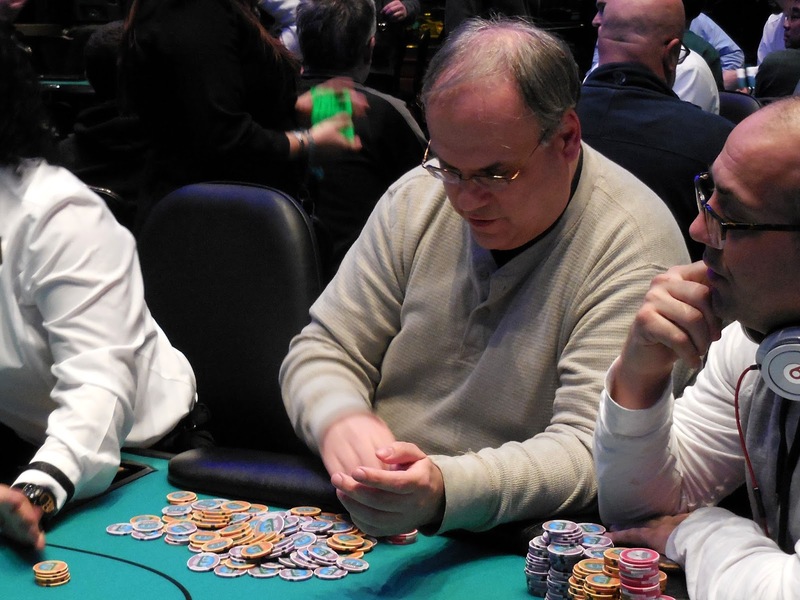 Hand 9: Kevin is in the big blind and a player in middle position limps. The button raises to 8,000 and Kevin gets out of the way, as does the limper. Hand 10: Kevin is in the small blind and moves all in after two limps. After everyone folds, Kevin says "best card in the deck" and shows the [as]. With 5 minutes left in Level 12, we were able to get chip counts on notables and our chip leaders. The field will play one more level before taking a dinner break. Flight B received a total of 300 entries, and at 6pm the field is down to 120 players remaining. Blinds are now 600/1,200 with a 200 ante. We will have updated chip counts shortly. Cards are in the air for Flight B of Event #1 $600 NLH. This tournament features a $500,000 Guarantee, and players begin with 20,000 chips. Registration and re-entries are available through the start of level 9, or approximately 3:30pm EST. Play will continue until approximately 12% of the field remains, and the survivors will return on Monday at 12pm for Day 2. Yesterday saw 230 entries for Flight A, and 28 players remain. The final 28 players have been reached in Event #1 $600 NLH Flight A. The players are now bagging up their chips, and they will return on Monday to join with the survivors from the remaining flights. 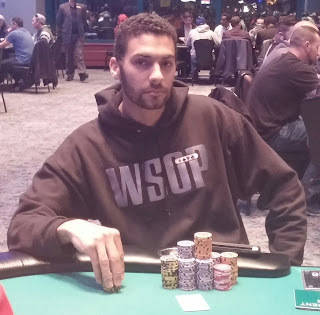 Meanwhile, Event #2 Omaha/8 is down to the final 3 players from a starting field of 63.